The M12TX RTD transmitter is easily ranged and programmable by a computer. The configuration kit required for programming is M12TX-CONFIG. This unique transmitter is ideal for areas with space limitations where traditional head connections are too large to fit. 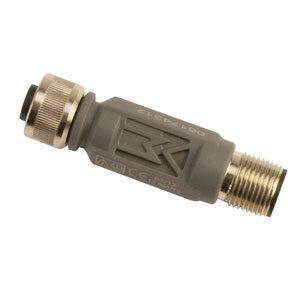 The M12 thread design offers a secure industrial connection. The integrated connection allows the transmitter to be mounted directly on to the sensor. *The M12TX-PT100 is compatible with all sensors with a "-2" European wiring option. For example: PR-26A-3-100-A-1/4-1200-M12-2, the -2 at the end of the part number specifies the wiring. The PR-22 probes have standard european wiring.